The GTO/SW4000XL Model Residential Swing Automatic Gate System for light commercial single or double residential gates. The Column Mount Solution. GTO/PRO SW4000XL/SW4200XL (SW4200XL) dual swing gate system. 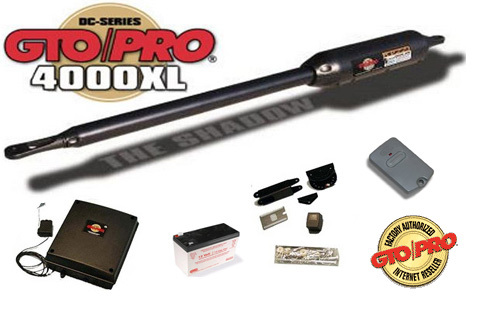 The GTO/PRO SW4200XL works as a "slave" automatic gate operator when installed with the GTO/PRO SW4000XL. 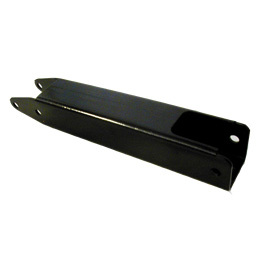 The PRO SW4200XL will work on gates that are 3.5 ft. to 16 ft. in length, and weighing up to 650 lb. The PRO SW4200XL wires into the "master" control box; the control board can be programmed for dual gate operation and the sequencing of the two gates. The PRO SW4200XL includes: operator arm w/ 50 ft. power cable, second operator wiring harness, mounting hardware, caution signs. The PRO SW4000 system is powered by a 12 volt DC /7.0 amp hour, sealed, rechargeable battery. Battery charge maintained by a 120 V AC/60 HTZ input and 18 V AC at 40. output, transformer rectified to 14 V DC through the GTO Control Board. GTO Solar Panel Charger: Float voltage 14.5 V DC output from a 19-3/8" x 15-1/4" silicon alloy panel. Generates minimum of 10 watts at 600 mA. A gated diode on the control board prevents battery discharge.